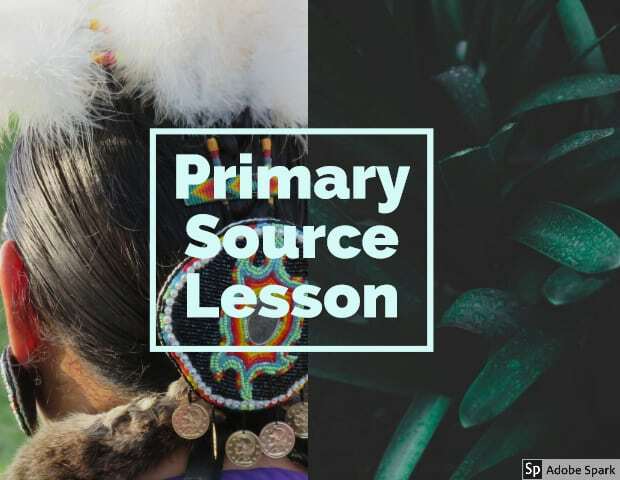 In this lesson, students will be exploring the importance of primary source documents as well as their use in understanding the past. This lesson particularly focus’ on the Wounded Knee Massacre through accounts of those who were there such as Flying Hawk and Black Elk and images such as a drawing depicting the start of the battle. 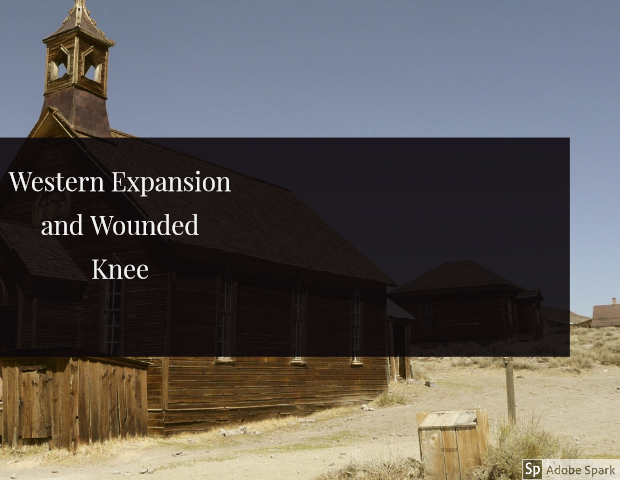 In this lesson, students will not only learn about the Wounded Knee Massacre but also about the importance of primary sources and how to analyze an event using multiple different forms of primary sources. 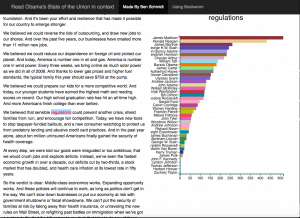 For my lesson, I will be using the State of the Union in Context which is a website that analyzes words in the state of the Union as said by previous presidents and displays a graph based on the frequency of the word usage. 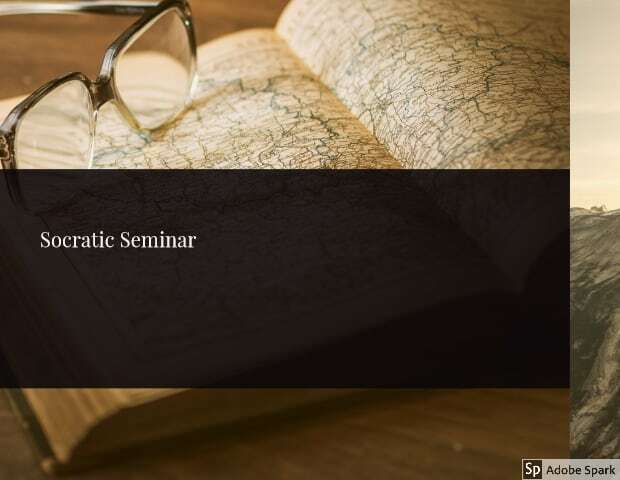 My lesson would start as an introduction to the presidency and a history of the challenges presidents have had to face during their time in office. The lesson then would be based around the students taking a noun such as a name or place and looking it up with the website. 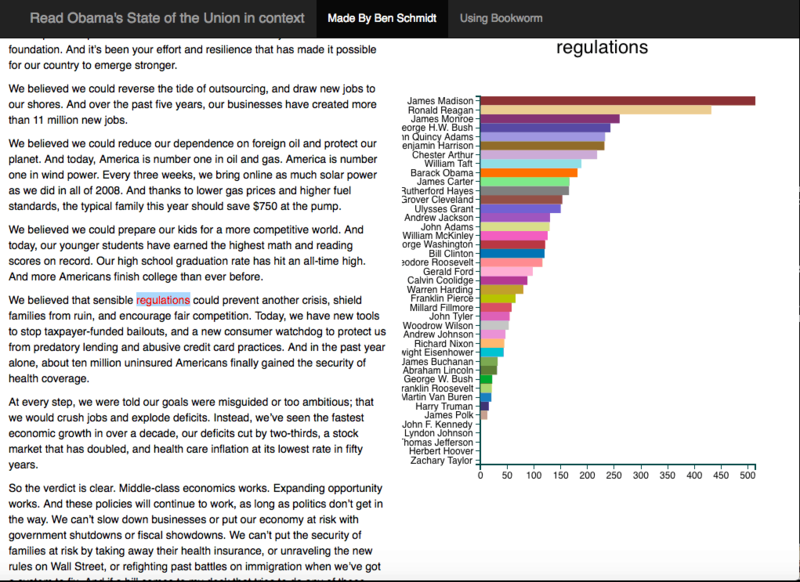 The students would then briefly research the presidents that pop up on the bar graph and what the word means to them. 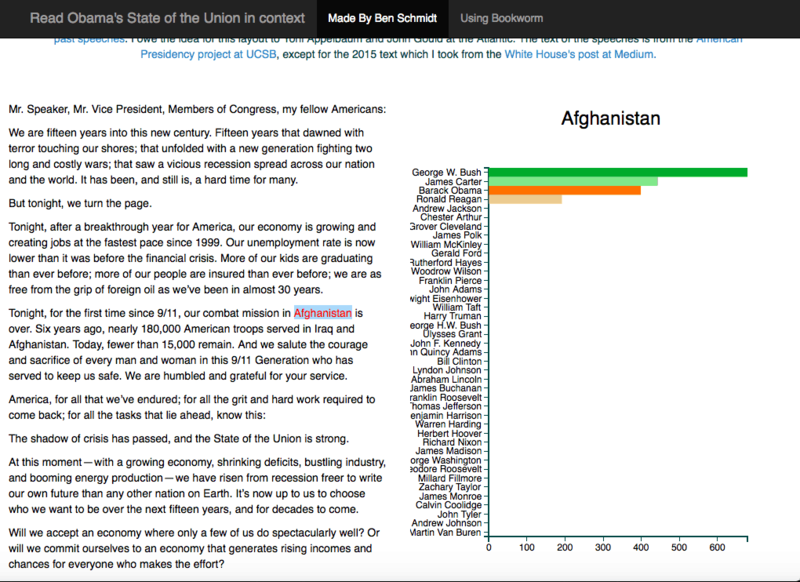 For example, one could look up ‘Afghanistan’ and the four most prominent presidents that appear on the bar graph are George W. Bush, Obama, Carter, an Reagan . 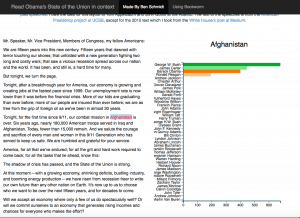 I would then have the student research these presidents briefly and have them find out why that word was so important to their respective presidencies. Students would them present their findings to the class. 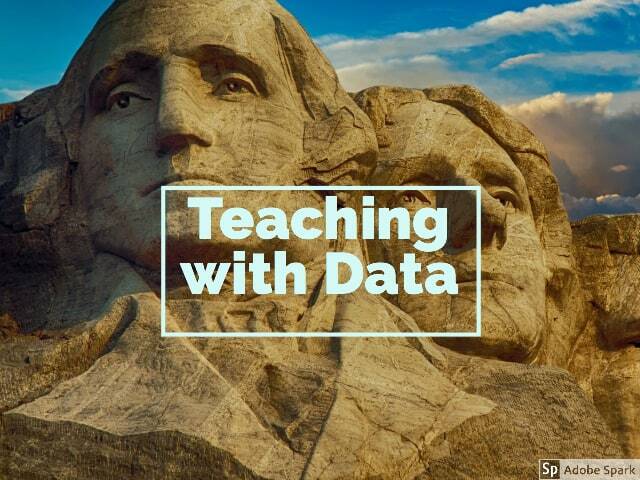 Overall, this lesson would not only teach students about the different situations that presidents had to face but also could show the similar circumstances that presidents faced such as war and economic depression. The context of the lesson is that my CT and I had just finished a unit based on American expansion and progression. The unit would cover things such as the American expansion westward, the Gilded Age, Progressive Era and Women’s Suffrage. The major question given over the course of the unit was “How should progress be defined in America?”. For our discussion method, we used an affinity mapping exercise in order to have a conversation on the unit. Students were given a stick note and asked to briefly give their definition as to what should define progress in America and why. They were asked to put these sticky notes on the board near the question. We then challenged students to take the sticky notes and arrange them into categories based on what was similar. After the students had done this, we would have a group discussion on the categories and why the students had decided to write about them in particular. I learned from this experience the need to diversify discussion activities. Prior to this, we had the students just share aloud with the class what they thought and if was often difficult to get them to respond, particularly 1st period. When we tried this new discussion technique, the students were more energetic and willing to answer. From now on, I plan to incorporate multiple types of discussion activities into my lessons.